You stay in small comfortable village guest houses and each day your luggage is taken ahead for you. During the day there will be several rest stops and a leisurely picnic lunch of locally cured hams and cheeses accompanied by freshly baked bread and salads. Evening meals give you the opportunity to sample the unique local cuisine and Spanish wines. Collection from Malaga airport at designated time and transfer to the picturesque village of Bubion, approximately a two hour drive. While in Bubion you will stay in the comfortable guest house Casa La Sevillana. Enjoy dinner with your guide this evening. Heading east to the village of Trevelez, the ride begins with a steep climb on an old bridle paths passing by ancient Moorish irrigation channels, sheep farms and old small holdings. At 1,950 metres we join the main forestry track for 5-6 kilometres. Here some nice canters are possible through the pine woods before rejoining the path. After a picnic lunch on the edge of the woods with panoramic views over the Contraviesa hills to the Mediterranean Sea the path starts the descent to the ravine ‘Barranco de la Vina’, approximately one hour with some sections on foot. In the Barranco de la Vina we join another dirt track that takes us the final hour to the Village of Trevelez. At 1,486 metres Trevelez is the highest municipality in Spain, it is also famous for its air cured ham ‘Jamon Serrano’. Overnight and dinner in the comfortable Hotel La Fragua situated in the old Berber section of the village. A swimming pool is available. Approximately 6 hours riding. The route continues east to the village of Berchules. After a 10 minute walk through the streets of Trevelez we water the horses at one of the many springs, mount up and head down to the river. Picnic lunch in the oak woods above the village of Juviles. After lunch the path continues for a while through the oak woods before joining the main dirt road for a steep climb to cross over to the small farms above Berchules. The final descent into the village of Berchules is on foot for about 30 minutes walk. Overnight and dinner in the very comfortable Hotel Berchules, A swimming pool is available June to late September. Approximately 6 hours riding. A long ride leading to the summit of the eastern peaks of Sierra Nevada. A day of spectacular views and grandiose mountains. Leaving the village below we take the old path winding its way up through the valley above the cause of the river. This path is over 1,000 years and a testimony to the craftmanship of the old builders. After a couple of hours leaving the path below us we join the main forestry track for about 4 km, here it is possible for some canters. Leaving the valley of Berchules we climb for a couple of hours across open mountainside to the Peñon del Puerto (2,760metres). From here we follow the ridge east for a further couple of hours to the Altos to San Juan (2,780metres), where we start a descent of approximately 600 metres. This descent takes us down to the tree line to join up with a forestry track. There are sections where it is necessary to lead the horses. Leaving the horses in the pine woods a vehicle will take us (approx.40 minutes) down to our hotel in the small village of Valor. Approximately 9 hours riding. Saddling our horses we return to the ridge of Puerto del Lobo to cross over to the north of Sierra Nevada. After an initial descent of about 400 metres we follow small sheep, cattle and bridle paths a between 2,400 and 2,000 metres west along Sierra Nevada’s north face. High Summer pastures, small streams and gullies, and lower down pine woods. Stunning views over the Altiplano and Guadix region. Tonight we stay in the high mountain refuge of Postero Alto. Here it is necessary to share rooms and shower room. Bring sleeping-bag or sheets and a towel, the refuge provides blankets. Approximately 7 hours riding. Another spectacular day, following foot and bridle paths through the mountains. The morning starts with a steep climb to nearly 3,000m, where if there has been a good Winter there will still be snow drifts. Passing over the summit we commence the descent into the valley of Trevelez on the southern side of Sierra Nevada. Small paths and old irrigation channels work their way along ridges and gullies and on down through pine and oak woods to the valley and village of Trevelez. Spectacular views of the Mulhacen and the Alcazaba, at 3,486m and 3,378 m two of the highest peaks in Spain. Today there are a number of descent where you need to lead the horse, the final one down to the village is nearly an hour. Overnight in the comfortable Hotel Fragua in the village of Trevelez. A swimming pool is available. Approximately 9 hours riding. 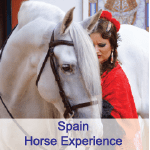 This route not only offers wonderful views out over the Contraviesa mountains and the Mediterranean sea, with some good opportunities for canters. Late lunch in the village of Capileira or Bubion. This afternoon is free for some last minute shopping and a well deserved siesta. Overnight in the village of Bubion and enjoy a farewell dinner. Approximately 3 to 4 hours. Transfer to Malaga Airport at a pre-arranged time. One night is spent in a high mountain refuge; the other six nights in comfortable village hotels (some with pools). Departs every Saturday and finishes on a Saturday. 2019: 25 May – 1 June, 22 – 29 June, 6 – 13 JulyNote: Rates are based on the Euros and subject to currency fluctuation. We will convert rates at time of enquiry and confirm final charges prior to final balance. We will provide travel information and a packing list.